So I bet you’re wondering: What about the second half of my Denver Comic Con road trip? Well, let me tell ya about it. 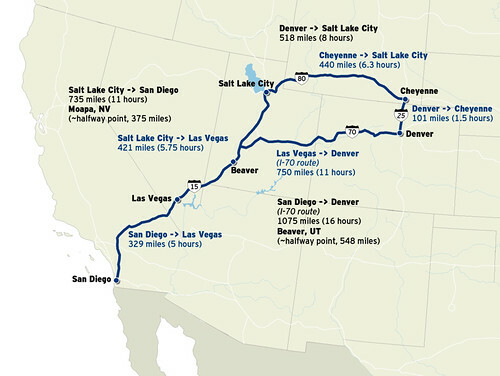 Once Denver Comic Con wrapped up (Memorial Day evening), I loaded the car and headed due north up I-25… which is the exact opposite route to return to San Diego. WAS I CONFUSED? ROAD-WEARY? ADDLED? Nope, I had designs on going to Cheyenne that evening, specifically The Loft— Wyoming’s best comic book shop. I arrived right at dusk, met with The Loft crew (incl. David J., Eric W. and Chris C.) and sold them a sizable stack of Cool Jerk books. The Loft gets my highest recommendation; the shop is clean and kid-friendly, the staff is helpful and super-engaged, and the owners (who were also en route from Denver Comic Con at the time) were exceptionally gracious in stocking their shelves with my books. I’d like to have a book signing there sometime in the future. Maybe next year? Speaking of having a book signing, I had a pre-planned engagement at Night Flight Comics in Salt Lake City on Wednesday, so I continued west on I-80 and spent the night in Laramie. The next morning I continued on to Salt Lake City and had dinner with Mimi Cruz, the co-owner/manager of Night Flight Comics’ two locations in SLC. After a good night’s rest, I had my signing the next morning. I tried something different: I offered a free copy of Cool Jerk Vol. 1: Hodabeast to the first 25 people who either Liked! my Cool Jerk Facebook page or signed onto my subscriber list. I got to meet a bunch of Night Flight’s regulars and introduce them to Cool Jerk (some folks went ahead and bought other copies and some canvas panels, too). I’m hoping these Cool Jerk newbies will be full-fledged Cool Jerk addicts by time I have a follow-up book signing. Thanks so much to Mimi and her crew for the hospitality, professionalism and adding a new stack of Cool Jerk books to Night Flight’s shelves. I couldn’t stay more than 4 1/2 hours at Night Flight because I was driving back to San Diego that day… which is about 11 hours southwest on I-15. I barreled along for more than 700 miles and will say the trip was pleasant and largely uneventful, aside from a quick meet-up with James Burns (if the name sounds familiar to you Cool Jerk readers, he’s the one who scripted Dangerman’s dialogue in his first appearances). I’ve known Burns for 35 years (!) and a couple years ago he and his family moved to Las Vegas. I couldn’t stay for more than 15-20 minutes because it was getting late, but I needed to hand-deliver a copy of Cool Jerk Vol. 4: Thinkulus to my bro. That’s customer service, I tell you what! Book Signing at Night Flight Comics (SLC)! 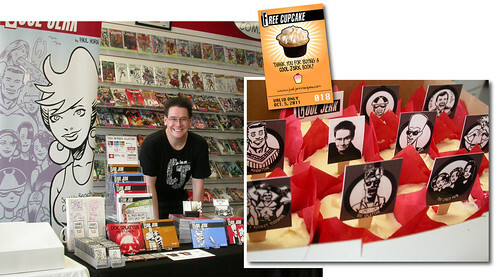 Hey, kids— I’ll be having a book signing at Night Flight Comics, Salt Lake City, on Wed. May 27! Like my library book “The Bigfoot Casebook,” it’s long overdue. 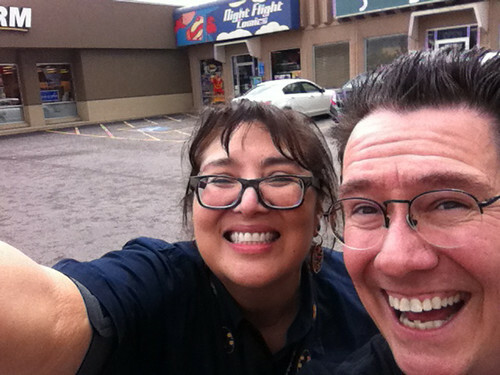 I’ve known store owner Mimi Cruz for several years and when I found myself driving to/from Denver Comic Con, I had to make it a point to stop by for a few hours! I admit, there may not be much familiarity with Cool Jerk up there in SLC, so I’m sweetening the experience. I’m giving away a FREE copy of Cool Jerk vol. 1: Hodabeast to the first 25 people to come by my table and LIKE! Cool Jerk on Facebook and/or sign up for my emailer. Here’s a poster with all the info you could ever possibly need (except a map). Click it to get the deets! Here’s a map I whipped up while you were checking out the poster. Many thanks to Night Flight Comics (and the staff) for hosting me for a few hours. Be sure to come by from 11am-3pm, get a free Hodabeast and help fund my drive back to San Diego by buying some of my other books! Click it to make it giganto! I noticed a lot of San Diego (and San Diego-area) regulars didn’t make it to Comic-Con last month. Maybe it was the high cost of tickets, maybe it was the near-impossibility to get tickets, maybe it was a conflict with work, school or vacation. Whatever the reason, I’m holding another “Cool Jerk Comic-CAN” for those who could not attend SDCC. Cool Jerk Vol. 4: Thinkulus is my newest collection, and I’ll be having a book signing at Southern California Comics in Kearny Mesa on August 31. That’s a Saturday, so I hope to catch as many of you on your day off (or at least on your lunch hour) as possible. Thinkulus is a $12 book, but if you need other volumes (Hodabeast, Chickadoowa and/or Bimboozled) I’ll be selling those at a discount. Heck— buy any two books and you a FREE Doc Splatter Ominous Omnibus! I’ll even bring my Canvas Panels, a sure-fire crowd pleaser. If you haven’t been to Southern California Comics, it’s kind of tricky to find. I’ve whipped up a locator map for you. In general, it’s very close to where Clairemont Mesa Blvd. crosses SR 163. Jamie Newbold is the owner; we’ve known each other for as long as his shop has been in existence. If you come by for Thinkulus, please take some extra time to explore/discover San Diego’s best comics store. I’ll be there from opening (11 a.m.) til at least 3 p.m. Hope to see you there! On the count of three, raise that left eyebrow! So I was having a store signing when all of a sudden Zeejay shows up. Yep, “Zeejay” is actually Zachary J. Simon, a long-time Cool Jerk reader and subscriber who won a contest I held a few months ago. The winner’s prize was a walk-on cameo in a Cool Jerk strip. Well, Zac has so much “friend equity” with Cool Jerk and has so many peccadilloes that I expanded his cameo into a full-fledged character. Then I blew his head off. Luckily, Zac took no offense to his libelous portrayal, and stopped by my signing to shoot me in the head the breeze and buy a bunch of Cool Jerk shwag. Thanks, Zeejay! Thanks also to Juan, Dan Horn (no relation), Danny and Rafael, who also bought some Cool Jerk books. 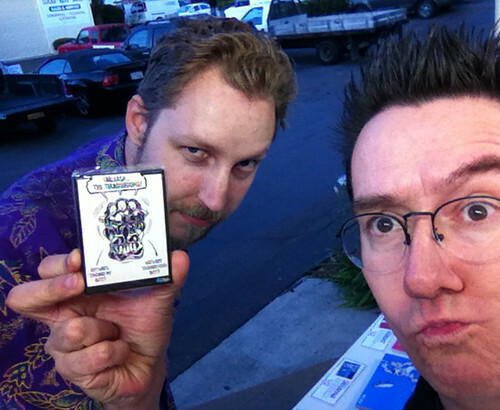 And thanks to the crew of Southern California Comics — Jamie, Shawn, Matt, the other Matt and Sam — who were great hosts. And thanks to by better half Darlene for baking up a box of puffy, salted chocolate chip cookies for the customers and crew. 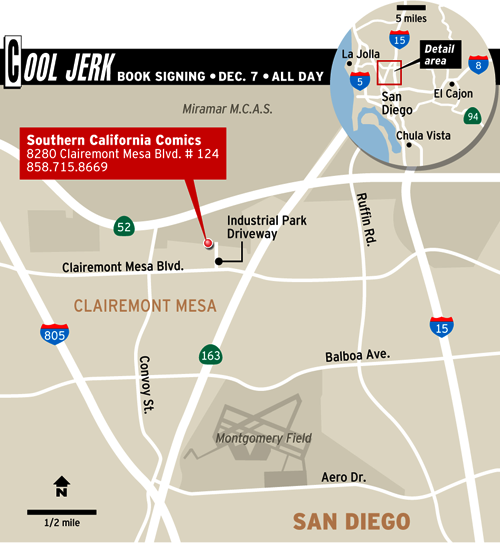 This one’s for you, San Diego— I’ll be having a pre-holiday Cool Jerk signing at my favorite area comics shop, Southern California Comics in Clairemont Mesa! Come by SCC on Dec. 7, which is a Wednesday (also known as New Comics Day™®©). I’ll have all my books, Cool Jerk t-shirts, Canvas Panels, original art and the like… and will be offering on-site specials. I’ve been shopping at SCC since geez, the late 1990s? They’ve thrived while many other area comics shops have shuttered their doors. Their inventory of Silver Age and Golden Age comics is without peer this side of Santa Monica. If you need new comics, recent back issues, statues and/or other collectibles, head here first. Owner Jamie Newbold and his staff have long been allies of Cool Jerk and I’d like to do what I can to drive new customers through their doors. Trust me— you'll need this map! Getting to Southern California Comics is a little tricky, if you haven’t been there before. Please use the map above, or log in their address into you smartphone. In general, it’s located in an industrial park on the north side of Clairemont Mesa Boulevard, two traffic lights west of SR 163. Drive all the way to the back of the driveway and it’s on the left. It’s well-worth the trip to find this hidden gem of a shop. Here’s Southern California Comics’ Facebook page. Go ahead and give ‘em a Like and be sure to come by Dec. 7th to pick off some holiday shopping! 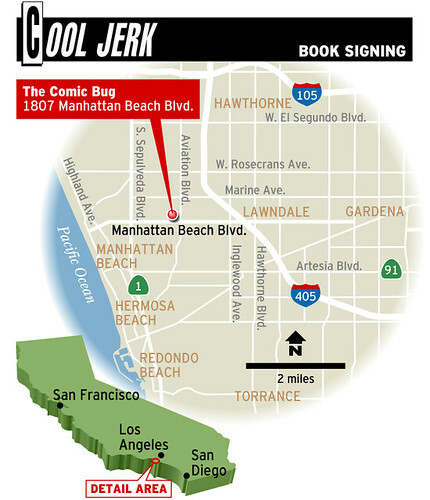 Thought I’d do a quick recap of my Cool Jerk book signing at The Comic Bug in Manhattan Beach last Wednesday. I arrived a bit early (I padded my drive time by an extra hour because it was raining pretty hard between San Diego and L.A.) and hung out with The Bug Crew— Mike, Jun and Greg. By time I got my table set up, justJENN and her youthful entourage (read: kids) arrived with boxes of cupcakes for book-buyers. Turnout was pretty good for a dreary* and humid Wednesday, and nearly everyone who stopped by the table and bought something was a new face! Thanks to Felix, Michelle and her family, Greg (and Alex, by proxy), Alan, Liz and Dianne (aka Pirate Space Queen) for adding Cool Jerk books to your Buy Pile this week! Also I got to meet comics writer Tracey Claverie. He was doing a signing for his comic, Scar Unit, right next to me. 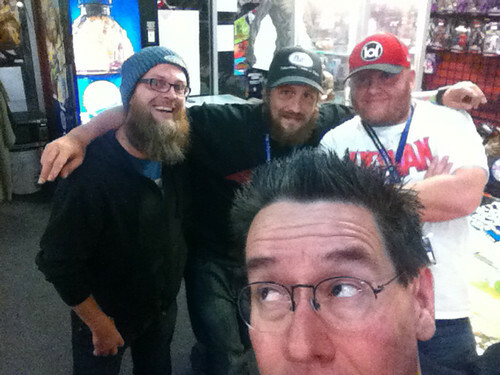 When there were lulls in patrons we ended up talking about comics influences, inappropriate cosplay and the best cheeseburgers in the tri-county area. Good guy, that Tracey. Thanks again to The Comic Bug and justJENN, without whom the signing wouldn’t have been possible. Hello, Southland Cool Jerk readers! Please take the day off work on Wednesday, October 5. Tell your boss you’re coming down with The Bug. But don’t say it’s The Comic Bug… because that’s where you’ll be heading to attend my store signing! Click it to posterize it! So come on down to lovely Manhattan Beach! 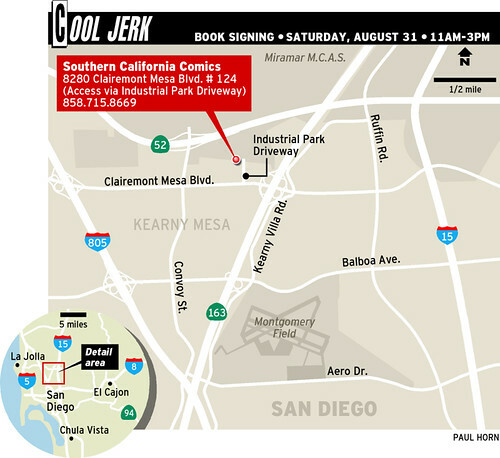 I’ll be there from 5pm-8pm to lure unsuspecting comics buyers into the Cool Jerk universe. I’ll have ALL my books on hand — including the brand-new Cool Jerk OMG Color! Vol. 1 — ready to personalize to you or a loved one with a signature and a spiffy character drawing! 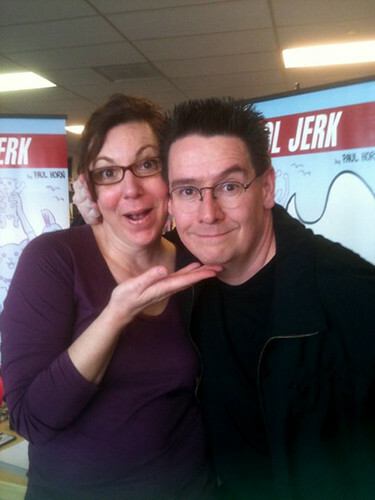 I realize many of you may already have some/all of my books, but do you have a Cool Jerk t-shirt? Or a Canvas Panel? I’ll have those on hand as well! And have I got a deal-sweetener for you! My friend and comics/graphic designer colleague justJENN is partnering with me and she’ll be providing some of her DELICIOUS CUPCAKES! (They’re so good, they were the Official Cupcake™ of the Paul and Darlene Wedding™!) You can’t buy them, tho— because they’re FREE when you buy a Cool Jerk collection (Hodabeast, Chickadoowa, Bimboozled, Doc Splatter Ominous Omnibus), a Cool Jerk t-shirt or Canvas Panel! • Buy any two $12 Cool Jerk collections for $20! And you get TWO FREE CUPCAKES! • NEWBIE DEAL: Buy Hodabeast AND Chickadoowa for $20, get Cool Jerk OMG Color! Vol. 1 FOR FREE! PLUS TWO CUPCAKES! 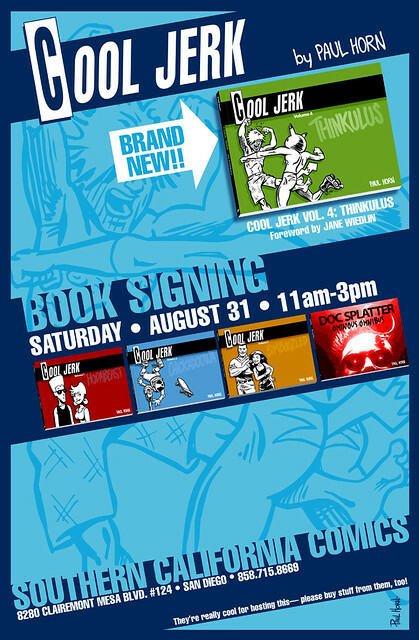 • Buy all three $12 Cool Jerk collections for $36, get Doc Splatter Ominous Omnibus FOR FREE! PLUS OMG Color! PLUS FOUR CUPCAKES! Geez. I should make all that into a chart. Speaking of, here’s a map I whipped up so you’ll know how to get there! And here’s the Facebook invite, if you’re so inclined to RSVP. Looking forward to this! Hope to see you there! 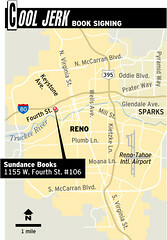 This past Saturday was my Cool Jerk book signing at Sundance Books in Reno, Nev. 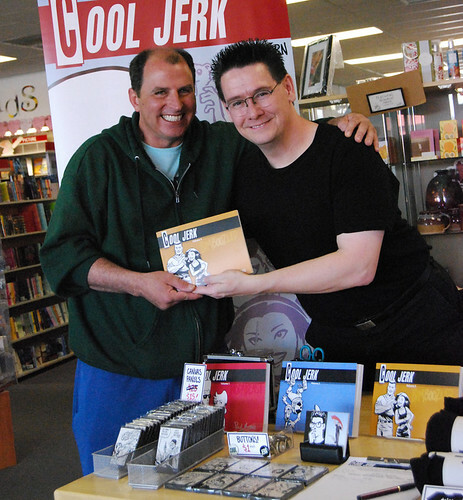 It was my first signing in Cool Jerk’s home town (Cool Jerk got its start in Northern Nevada, running in the Reno Gazette-Journal for several years before I took it online), and if Saturday’s turnout is any indication, it certainly won’t be my last. To make this event even more, um, eventful, Nancy Horn of Dish Cafe and Catering was on-hand to provide delicious baked refreshments — ”Pupcakes!” They were white wine cupcakes with cream cheese frosting and black sprinkles. Black and white, just like my strip. 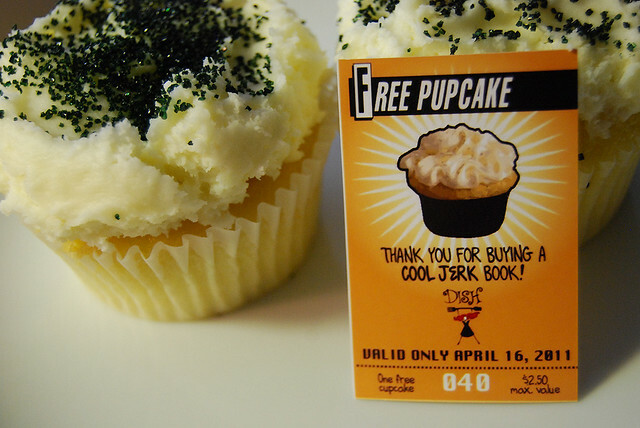 If you bought a book, you got a free Pupcake. And if you got a Pupcake, you know it was incredibly good. 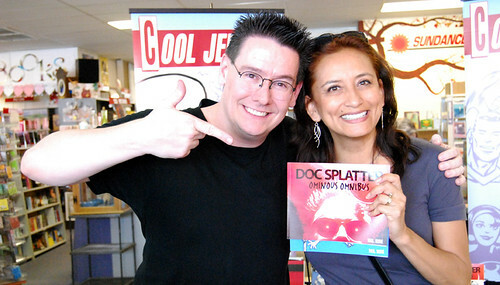 So I’d like to say hi and thanks to Andy Carey (Doc Splatter letter-writer who received a “goodie,” as is tradition), Guy Clifton (look him up in the index of Bimboozled), Frank Mullen (and Susan, by proxy), Nikki Bomagat, Steve Timko (also in Bimboozled, kinda), Claudia Ortega-Lukas and her mom, Nancy’s mom Cherie, Greg Moyle (another Doc Splatter letter-writer, see page 11 of the Doc Splatter Ominous Omnibus), Mark Lindquist and his boys, Vickie Johnson, Jim, Angel and Gabri Bachand, Ben “Buzzy” Martin (we go WAY back, like ninth grade), Shelly Larson (OMG Shelly! ), Charles Nemitz, Bryan Allison (by phone), the aforementioned Nancy and Jen. 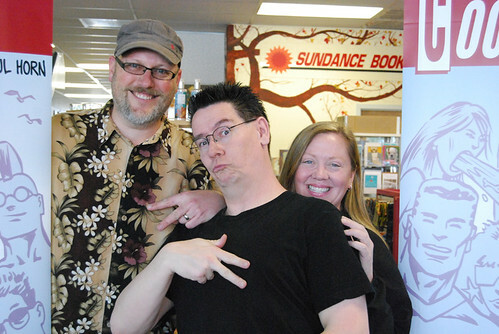 And, of course, the staff at Sundance Books — Dan and Phillip (and Christine and KC by proxy) — for making the signing as smooth as can be and for restocking their shelves with all my books! 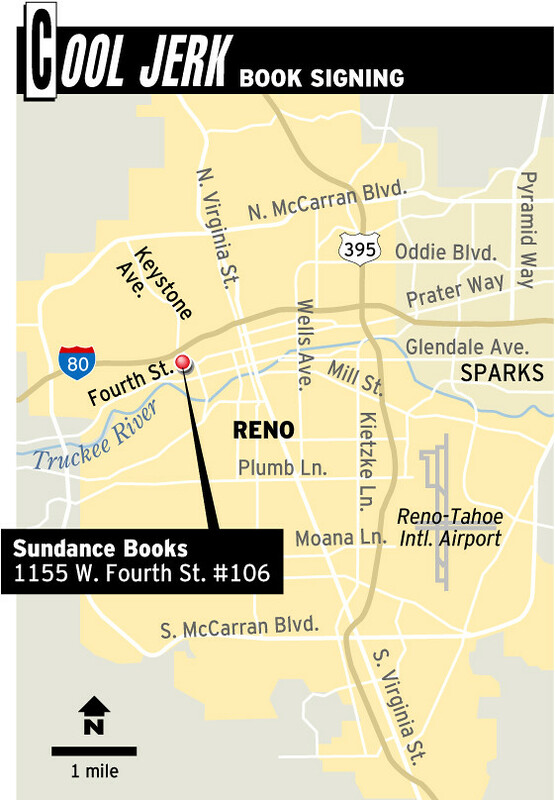 So in case you missed it, head on down to Sundance, buy a book or two, and bring it by next time I’m up in the Truckee Meadows for another signing! Oh, and Ben? You’re on page 11 of the Doc Splatter Ominous Omnibus, too! Horns team up to conquer Reno! Nancy Horn — owner of DISH Cafe — agreed to partner with me for the signing. And by “agreed” I mean “succumbed to blackmail.” See, Nancy and I go WAY back. Back in the college days, we both worked for the UNR Sagebrush (she was the variety editor and wrote a food column, and I was production director, page designer and staff cartoonist). In fact, SHE’S responsible for the “death” of Doc Splatter, back in 1990. Well, we’ve both pursued our dreams, and over the past several years she’s become a foodie luminary in Northern Nevada. You might’ve eaten at DISH, read about her in various regional and national publications or even seen her on Diners, Drive-Ins and Dives. Well, she’ll be there with Cool Jerk-related desserts that’s still under wraps at this writing. But I guarantee it’ll be fun and flavorful. Click it to see all the deets! Here’s how I’m folding the comics-and-cuisine thing together into a riot-inducing, must-not-miss event: For every Cool Jerk book you purchase, you get a DISH coupon for FREE EATS! I’ll only have a couple/few dozen coupons so it’s first come/first served, and there’s a limit of four tickets per person. 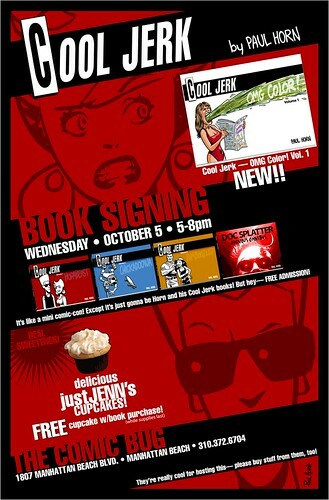 I’ll have all four Cool Jerk and Doc Splatter books on hand, ready to personalize to you with a sketch. Also, I’ll be bringing buttons, stickers, t-shirts, original art sketches and canvas panels. It’ll be like a micro comic-con, but with free admission and free food! The signing is only two hours (1pm to 3pm) so be sure to schedule your appetite accordingly! ps Nancy Horn is no relation, actually, but my for-realz sister will be there! Not the storage company, steak sauce or the newspaper’s front page. I’m talking A-1 Comics! I confess — Sacramento confuses me. I navigate by instinct! 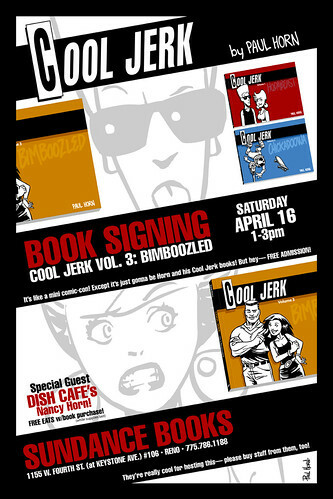 I’ll be doing a Cool Jerk book signing at one of my favorite comic book shops — A-1 Comics in Sacramento — this Saturday, Nov. 6, from 11am to 2pm. 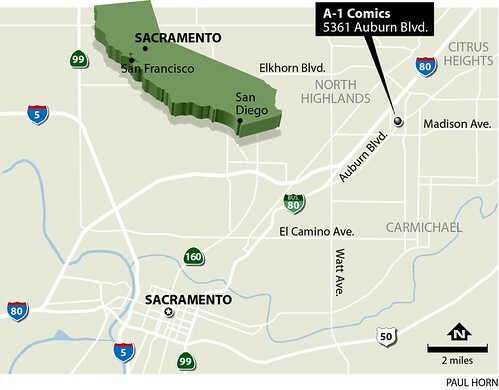 A-1 is located at 5361 Auburn Blvd. in Sacramento (NOT the Roseville location). I’ll have all my books on-hand, plus the Canvas Panels I debuted at Comic-Con this summer. THREE HOURS ONLY!! Tell your friends!! It’d be nice to say hi to you Sacramento-area readers (many of whom I’m sure joined this mailer at APE or WonderCon in years past) and introduce you to my newest book, Bimboozled!